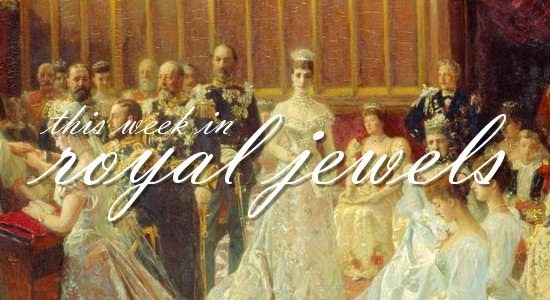 It's a battle of the royal earrings this week! Be sure to register a vote for your favorites in the poll below! 10. We got a good look at the Duchess of Cambridge's new Kiki McDonough morganite and diamond drop earrings on Friday when William and Kate visited XLP in London. 9. Last Thursday, the Countess of Wessex attended the reburial service for King Richard III in Leicester. She wore her lemon topaz earrings by Heavenly Necklaces. 8. When you're attending the horse trials at Gatcombe Park, the teensiest golden stud earrings, like the ones worn on Saturday by Princess Anne, are perfectly appropriate. 7. A regally-bejeweled Queen Sofia of Spain, wearing pearls, golden earrings, a floral brooch, and stacks of bracelets, attended the Real Foundation Awards in Toledo on Friday. 6. The Duchess of Cornwall's pearl earrings just peeked out from under her hat at the races on Sunday, which benefitted the Prince's Countryside Fund. 5. The Danish crown princely couple visited Japan this week; Crown Princess Mary paired pearl earrings with her floral dress to open an exhibit about Greenland on Friday. 4. On Saturday, Mary wore glittering floral earrings in Tokyo. 3. Queen Elizabeth II brought out some major glitter to launch the George III Project on Wednesday: the Cullinan V Brooch. 2. The Queen distributed Maundy money for the sixtieth time on Thursday, this time while wearing the Mappin and Webb Orchid Brooch at Sheffield Cathedral. 1. No one out-glittered Princess Caroline this week; she attended the annual Rose Ball in Monaco wearing a pair of gorgeous Art Deco earrings, which may have belonged to her grandmother, Princess Charlotte, and her diamond fringe necklace. More sparkle from the Rose Ball here!